AFC - 06/19/06 Horses in HNK??? Theatre, culture, art, singing, act, orchestra, lights and horses. In this line of words it is not hard to add terms that do not belong here. Well, behind this specific word there are scared animals that before each show in the Croatian National Theatre (HNK) are brought in to "act" in the opera "Ero s onoga svijeta." Is the HNK really the right place for horses? Is it really necessary to bring in horses for each show and force them to stand on stage under lights and in orchestra noise in order to make the theater scene of that opera house that Croatia is so proud of look filled? Is animal exploitation part of culture and art? 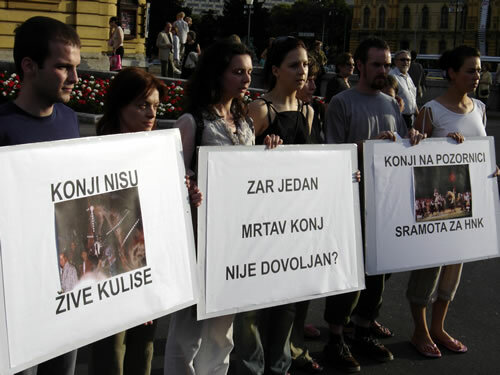 Animal Friends announces a protest today, on June 19, 2006, at 7 P.M. in front of HNK urging to stop exploitation and torture of horses as life-scene in the "Ero s onoga svijeta" show. The organization Animal Friends considers animal "acts" in theatre shows and torturing them for art and culture unacceptable. Visitors should listen and watch human skills of singing and acting, not scared animals that don't belong there. In the beginning of this month Dubrovnik which is one of most significant cultural centers of Croatia and Europe became the 29th town in Croatia that banned circuses with animal acts in their shows. The HNK, instead of preceding as a respectable institution in culture and high civilized art, by exploiting and torturing animals on their stage mock Croatian culture and art. According to the statements of one HNK employee, a few years ago one of the horses broke his leg during the show and was killed afterwards. Tragedies like these should arouse responsible individuals in the national theatre house HNK to understand that a theatre stage is meant for actors and singers, who decided to be stage artists, not for scared animals, that don't have any choice. We hope that the HNK will seriously think about this for their own reputation's sake and the sake of Croatia's capital city and that maybe tomorrow's show of "Ero s onoga svijeta" will be without horses as life-scene.